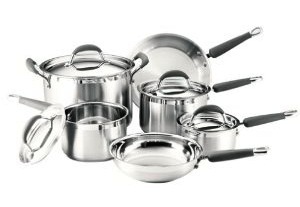 If you are looking for a deal on nice cookware, I have a fun one to share with you. A sweet friend of mine who loves to cook gave me the heads up on a Kitchenaid Cookware set for $119.99 through Amazon lightning deals today. It’s only available for 3 more hours or until it sells out, so don’t wait if this is something you need. The set is also really highly reviewed which always helps when you are wanting to purchase such a big ticket item.